Every great product has to have a great beginning. We travel to the source to hand pick the particular used whiskey barrels that we will use to make your special piece. The barrels are made from 1” thick American White Oak staves that are reinforced with six steel hoops. They weigh approximately 120 pounds each, are 36” tall and have a 24” diameter at their widest point; the top and bottom diameter is about 21”. All barrels originate from well-known cooperages from around the country. The first thing we do when we get the barrels back to our workshop is clean them. This cleaning removes the dust and dirt that collects on them while they are at the distillery, but it does not remove all of the distillery stamps and stains that naturally occur during the distilling and aging process. We try to pick the very best, but they are vintage whiskey barrels. No two barrels are alike. All barrels will have blemishes and other slight imperfections that give each one its unique character. These imperfections in no way affect the integrity of the barrels for our purposes. 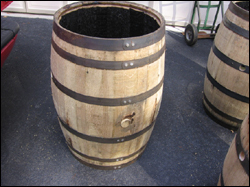 After cleaning and drying, the barrels are ready to be made into quality Reel Barrels® garden storage accessories. Some products will receive a Pacific Redwood stain, while others will remain natural. All products receive a double coat of marine grade spar varnish to enhance their natural wood grain and to protect them from the elements. Although we use the very best finishes, you will need to clean and re-coat your Reel Barrels® every couple of years to maintain the finish. If you like, you can leave your barrel as is and allow it to weather to a beautiful patina. After all, a weathered vintage barrel is a beautiful barrel! Jack Daniels Whiskey Barrels Available! 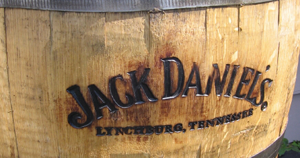 We go direct to the distillery in Lynchburg, Tennessee to pick up custom Jack Daniel’s branded barrels. These barrels are branded on the front of the barrel as well as the top. 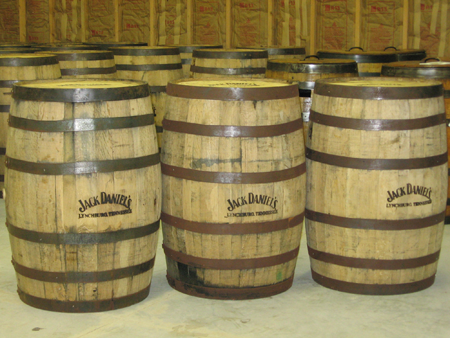 These are the same quality barrels we use for all of our products, but now you can special order your Reel Barrel®, rain barrel or trash barrel to be made with a Jack Daniel’s branded barrel. Jack charges extra for his branding and therefore we charge an additional $70 for each custom Jack Daniel’s barrel piece. Customize Your Reel Barrels® Products!